One set of building plans to create behind-the-door storage for anywhere in your home. 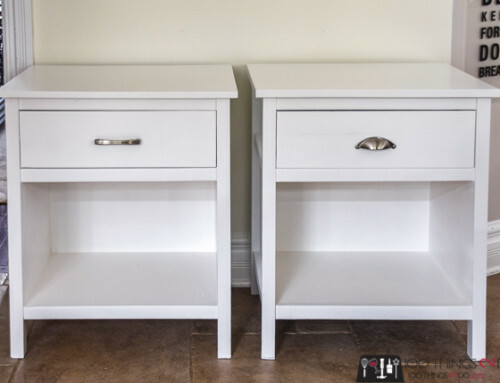 I created extra bathroom storage for my tweens and a gift wrap storage solution for my office. Use that wasted space with this simple build. Do you have storage and organization issues? Like more stuff than space? I think everyone (except maybe Mari Kondo) does. We all want to be tidy and organized, but “stuff” takes over and clutter everything up. If you are struggling to find room for everything you own then you might benefit from visiting www.keepsafestorage.com.au. What if I showed you a way to keep your stuff, keep it organized and keep it tucked away and tidy? 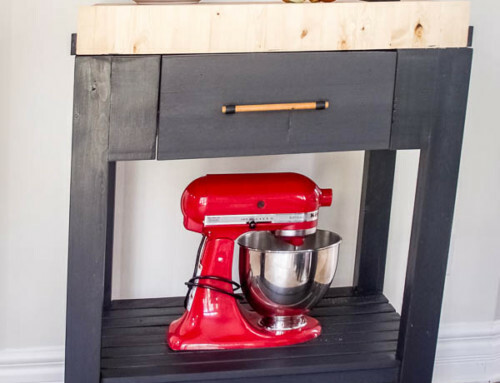 That was the goal when Jen and I worked on this behind-the-door storage rack; I needed some extra storage for two tween girls in one bathroom – because come on, at 11 and 12 you know the ‘girly stuff’ is only going to get worse. The original idea was to attach this behind-the-door storage unit to the back of the door – and with the proper drywall anchors you totally can – I just decided to go with the wall for more stability; so that their hair products and nail polish won’t jostle around. Just look at that unused space! 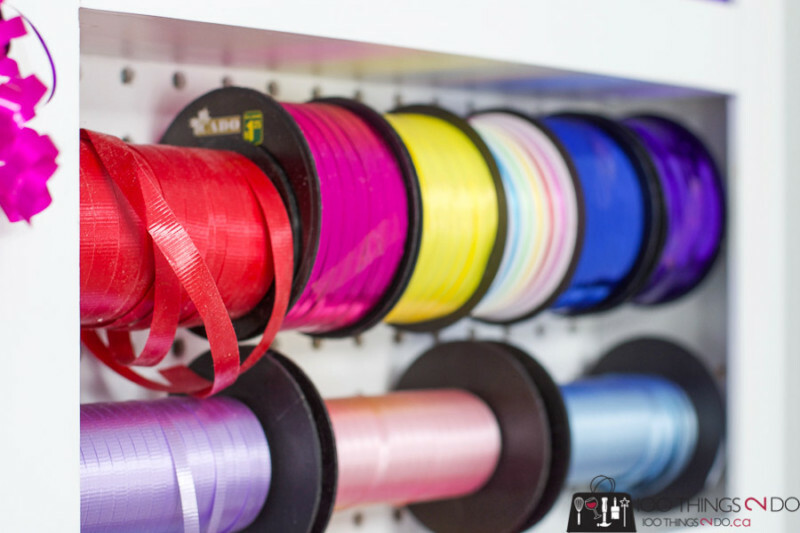 use 1/8″ metal rods across the front of each shelf for extra security (as you’ll see below). This bathroom unit is 17″ wide, 35″ tall and 3 ½” deep. I’ll show you how I made the gift wrap storage unit – which is much larger – below. Start by drilling pocket holes into either end of your 40 ½” boards. If using a Kreg Jig, make sure the jig is set for ¾” wood. I like to pre-sand my wood before assembly to make life easier. Using a speed square, line up your top and bottom boards to your sides – use wood glue and 1 ¼” pocket hole screws to attach. 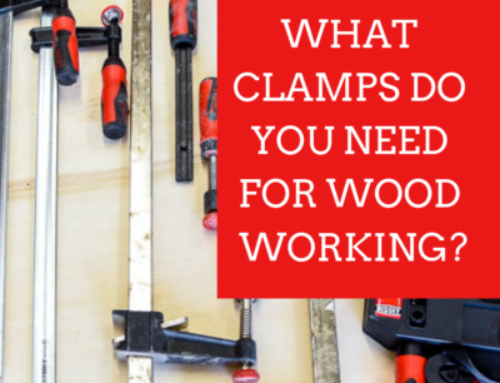 Clamping the boards tightly before screwing together will make sure that the boards stay flush. Repeat with the remaining shelves – I set out some gift bags and pre-measured my largest roll of wrapping paper to determine what heights each of my shelves would be at. The pegboard you see in the back is not attached at this point – I was just using it to make sure my gift wrap storage rack remained square. I went with a pegboard backing for this project because I wanted to be able to add hooks to hang bows etc from. You can save yourself some time and energy and not worry about that because command hooks would have done the same job with less cutting. (I always learn the hard way?) If you do go with pegboard, then remember to add a ¾” square wood dowel to the back of the shelf before attaching the pegboard itself. This will allow you to insert hooks in the pegboard without bumping directly into your drywall or door back. The photo below is of the unit back facing up. I only wanted hooks in the upper section of my behind-the-door-storage rack, so I attached two dowels in the top and bottom of the top shelf with wood glue and finishing nails, and then cut the pegboard to fit that section. I ripped down some 2×4″ wood I had in the garage to ¼” widths to create the face frame for my gift wrap storage. If you aren’t drowning in scrap wood – like I am – then you can pick up some poplar trim at your home improvement store. It should be ¼” thick by 1 ½” wide – then cut to the lengths to fit your frame. I chose to fill the pocket holes in the two middle sections because that’s the height you might see them at – no biggie if you skip this, the shelves will be filled anyways. Use some wood filler to clean up the nail holes (and any boo boo’s) and then sand everything smooth. 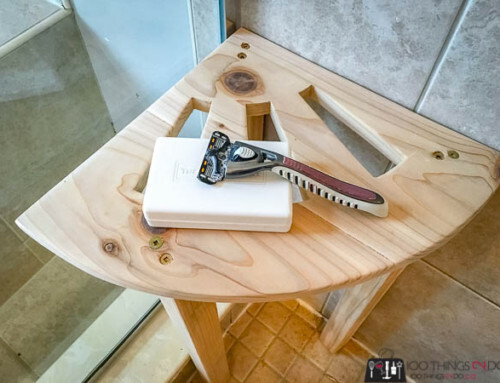 Prime the entire piece – please don’t skip this step – MDF (like pegboard) is a sponge and can quickly warp with a too-thick layer of paint, or moisture in the bathroom. After priming, give it a light sanding with 320 grit and you are ready to paint! (affiliate link) with a weight capacity of 75lbs. This first photo is with my behind-the-door-storage rack styled with pretty birthday papers and bows. Then I thought, maybe I should actually store all of my stuff and not just the pretty bits, so I filled it with all of my gift bags, ribbons and gift wrap (including Christmas). This gift wrap storage easily fits 20 rolls of wrapping paper! I drilled 5/32″ holes through the sides of the cabinet once I knew where I wanted the 1/8″ metal rods. I didn’t need these for the bathroom storage cabinet, but to keep bags and wrap upright and tidy I did need a couple. I also inserted two to hold curling ribbon in place. I have 20 gift bags tucked into the top section of my gift wrap storage unit – with room for a couple more if needed. You can see the command hooks on the side to hold the bows – that’s when I figured out I didn’t really need to do the raised pegboard section (facepalm). If you can, hang your behind-the-door-storage rack so that the top of it is flush, or slightly lower, than the top of the door its tucked behind. I had a cooling vent in the way, so about 6″ of mine is visible when the door is open. Again, not a big deal – but I’ll save you noticing it later. If you’re looking for a more portable gift wrap station, you can check out my building plans for the gift wrap caddy here. 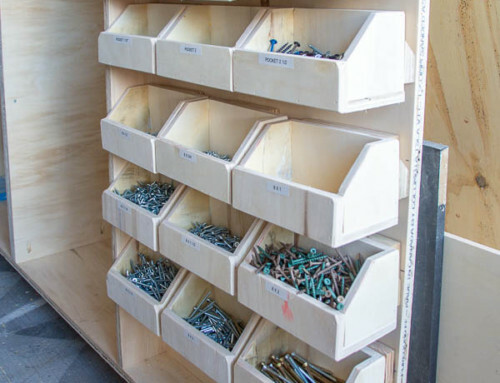 Two behind-the-door-storage solutions with one building plan – thank you Jen!! The girls have already started filling theirs up. If you’re still struggling to store all of your stuff. It might be a good idea to look into a storage unit, my friend was telling me about south jersey movers and the fantastic storage services they offer to anyone that needs it. But I digress.